Recent research has shown that social media platforms like twitter can provide relevant information to improve situation awareness during emergencies. Previous work is mostly concentrated on the classification and analysis of tweets utilizing crowdsourcing or machine learning techniques. However, managing the high volume and velocity of social media messages still remains challenging. 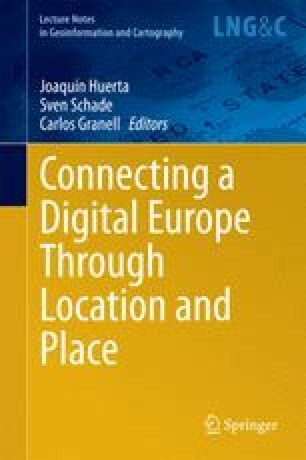 In order to enhance information extraction from social media, this chapter presents a new approach that relies upon the geographical relations between twitter data and flood phenomena. Our approach uses specific geographical features like hydrological data and digital elevation models to prioritize crisis-relevant twitter messages. We apply this approach to examine the River Elbe Flood in Germany in June 2013. The results show that our approach based on geographical relations can enhance information extraction from volunteered geographic information, thus being valuable for both crisis response and preventive flood monitoring. The authors would like to thank Matthias Stork for the ideas and discussions on hydrological models, as well as the German Federal Waterways and Shipping Administration and the German Federal Institute for Hydrology for providing the water level data. João Porto de Albuquerque would like to express gratitude to FAPESP (grant 2012/18675-1) and CAPES (grant 12065-13-7) for funding.